On a Student Job Search? Have you found what you're looking for yet? A student job search might be easier said than done. I suppose this could be said about any job search. But, it's really difficult when you don't know how to go about doing it. This page will help you understand the methods I have used to find perfect college student jobs. not too involving (this is super important if you are a full-time student), and cover some of your expenses each month. A job that offers tuition reimbursement or health-benefits to part-time employees doesn't hurt either! Something to remember during this whole process is that you need to draw upon all of your resources! Resources are potential opportunities for employment and people who can help you get it. You'll also want to remember that this will take some time. No one is going to find a job for you, except you. You are the one who is in charge of the whole student job search! This means that nothing gets done unless you are willing to put forth the effort to find the job that suits your situation. Now that we understand the ground rules, lets get to it! 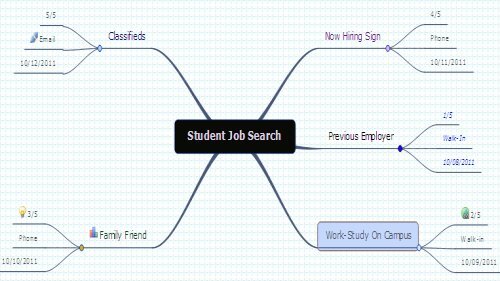 Where do I start my Student Job Search? The easiest place to start your student job search is with a blank sheet of paper. You're probably wondering why you need a blank sheet of paper? The answer is because you are going to write down every possible idea and resource that you have to help you find a job. I usually use a method of note taking called mind-mapping. This is a type of note taking created by Tony Buzan, a famous expert on the mind. This helps me with any topic I am researching/ brainstorming. To do this, turn your page side-ways and write your main topic in the center of the page and circle it. Then draw four or five diagonal lines out from both the left and right sides of the circle, like wheel rim spokes (give yourself some room to write and use the white space of the paper). Next, start writing down any ideas that come to mind about where you might find potential employment. Put one idea per diagonal line. This list could include: opportunities on campus, on the school's website, in the employment section, family and friends in the area, past employers, newspapers (classifieds), online websites, places you've seen hiring around town, etc. Each line will contain the name of a potential employment resource. Keep doing this until you fill up all the diagonal lines coming out from the center. You might need more than 7 or 8 lines when you start writing down ideas. Just branch out from the middle circle as you need to. After you have all your ideas written down, now go back to each idea and draw 3 lines out from the end of the line the idea is written on (I know this sounds abstract, so see example below if you are still confused). 1) On a scale of 1 to 8 (or 10 or 12, however many resources you came up with) rate the likelihood that this resource will produce employment (just use your best, intuitive, judgement). 2) How you are going to contact this resource? Phone, email, or in-person? This must be a direct contact method. I wouldn't count a text message as a method of contact (but don't rule it out all together), and definitely not a "contact us" form on a company website. Results come through action. The only way you can produce different results is by different actions. You must be active in your student job search if you want any job offers to come your way! 3) When you are going to contact that resource. You're looking for an actual date like 10/1/2011. Having a "deadline" to your job search will help put your plan into action. I made this with a FREE mind-mapping, in-browser, software called wisemapping. You can access this at www.wisemapping.com/c/try.htm. After you have created this list, you now have an actionable plan to find a job! Make sure that after putting all of this information together that you use it. Stick to the dates that you have set for yourself and contact those different resources. I personally did this when I was looking for a job and after trying 8 or 9 resources, I finally found employment through a former employer. Persistence pays off! What should I look for in a student job? If you are a returning student with kids, then you probably already have a job or at least need one that will also provide for your family. If you are a married student with no kids, then you need to speak with your spouse and determine what your needs are and go from there. This is just a simple list with a few ideas you should keep in mind while on your student job search. But, if you have other things that you'd like, then add them to the list! If you are ambitious enough and patient enough, then you can find the job you want. Think about your situation and determine which things you need from your job and what things you can do without. What's next in my Student Job Search? After you have made a plan and determined what you want in a job, then the next step is action! You need to devote some time each week to find a job. Until you actually find a job, your student job search IS your job! If you need to find a job right away, make a commitment to spending 10 to 15 hours per week (or more) to finding a job. Fill out applications and deliver them to potential employers. Meet and introduce yourself to managers. When you meet managers for the first time, you really want to make a good first impression. I have been a manager in a retail environment. I was in charge of hiring and firing people (I didn't like the firing part). Applicants who made a good first impression had an immediate advantage over other applicants. - Be & look professional! You need to "sell yourself"! The idea with these tips on making a good first impression are to impress the manager so much that he or she will do an interview with you on the spot! You are already dressed for the interview, you are confident, you are in the job frame of mind because you have been on your student job search! If you feel confident enough, ask for the interview that day! Give them your best! This will shine through and the manager will notice! As you are out actively looking for college student jobs, use the power of your network of friends and get the word out that you are looking for a job! Facebook is the simplest way to get the help and notice of hundreds of people! Post on Facebook about your job search! Make your updates about what you did in your student job search that day. Friends and family will see these updates, comment on them, and immediately become eyes and ears for you about potential job openings! Even if just 10 of your friends are aware of your situation and thinking about your job search, then they will become more attuned to "now hiring" and "help wanted" signs and will let you know about them! The power of this when finding a job is immeasurable! Let your friends know you are looking and that you are open to their ideas for work, and then they will bring back results! Just make sure to keep it in their minds by updating frequently about your student job search. Make sure that if you use the aid of your friends in finding a job that you make sure to give thanks to everyone and anyone who offers ideas or help. That kind of gratitude will bring more and more results to you. Plus, your friends will feel better about helping you. Cultivate the attitude of gratitude. If you find a job, it might be good to send a personal thank you note to the friend or family member who referred you to the job. What Other Resources Should I Utilize? If you have used all of the sources from your action plan and still want to find other ways to build connections, then I would recommend a professional networking site called linkedin.com. This is a free service that you can utilize as another resource to help you find a job. You can use this service to network with people you know (and it may pleasently suprise you who you know on linkedin). Even if you have a job, this is a great tool to use as a college student! Think of how much easier a network of professionals will make it when you need to find a job after college! Linkedin will help you build that network. Listen, the bottom line is that it is up to you to find a job that will work for you as a college student. If you are active in your student job search, then finding a great job will be easier than you think! Make a plan and execute it. Stick to the deadlines you make for yourself. Use your network of friends to leverage your time in finding a job. Be professional as you meet and greet with managers by shaking their hands, making good eye contact, and asking for an interview. Be persistent after the interview too. If you haven't heard from them in a week, drop by and follow up with the manager or whoever interviewed you. Ask them if they have made a decision yet, and express your desire for the job. Finished with the Student Job Search? Now get prepared for the Interview! Is a Job Really a Good Idea as A College Student?